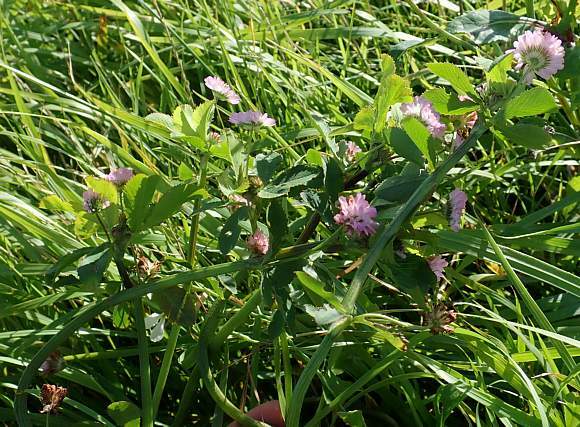 Sprawling with long thick stems amongst the other vegetation near the side of an arable field. It is usually planted as a nitrogen fixer for the soil, but this was the only specimen your Author saw. It is maybe last years sowing which has sprung up again(?). Only the flowerheads were previously on the surface until your Author gently raised them out of the thick vegetation to see what's what. [The field opposite had been planted with acres of Crimson Clover for a similar reason]. 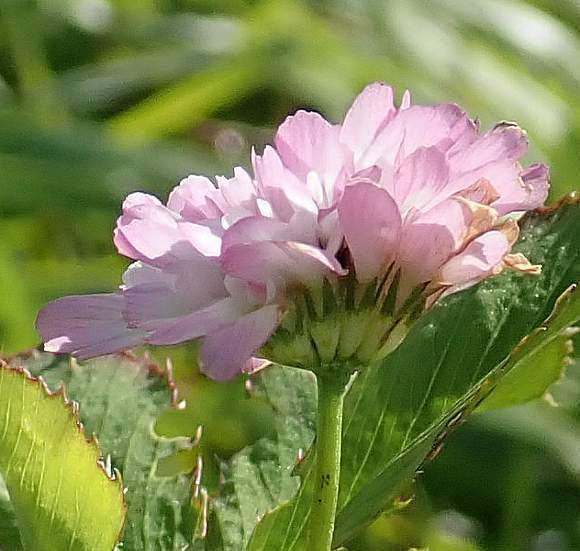 From above the flowerheads of this clover look strangely flatter than other clovers. 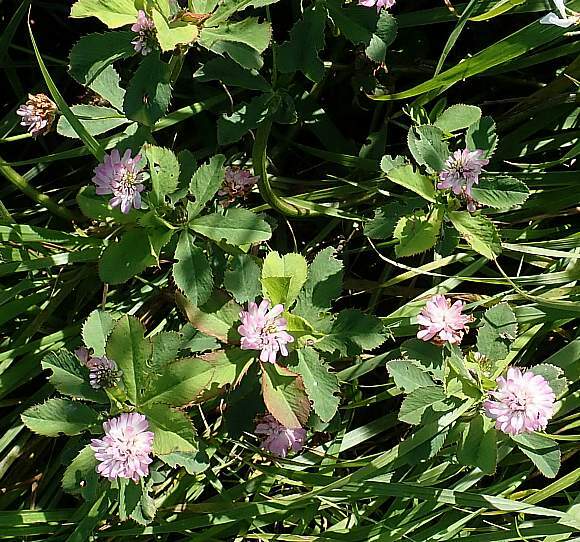 From above it looks as though each flower has maybe 6 leaves around it, when leaves on other clovers are in threes. But they are in 3's here too! 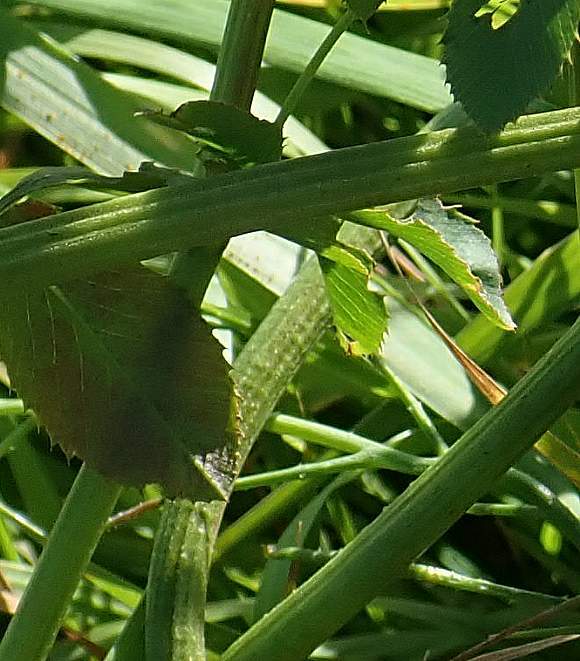 It's just that from above the leaves look like they are in 6's (or sometimes 9's). 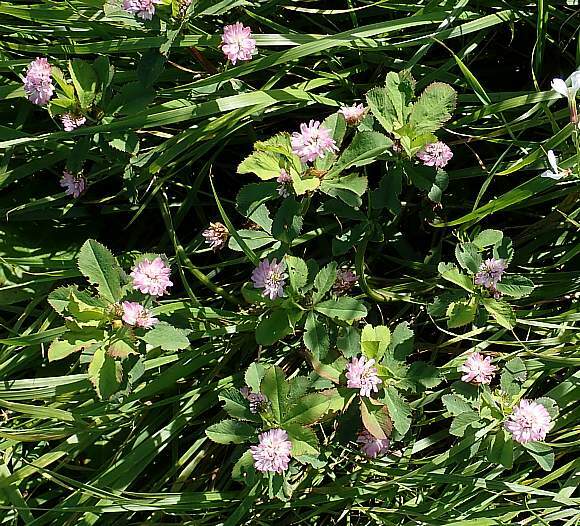 The leaves are oval(ish), often have long(ish) teeth (in comparison to other clovers) but they are still in 3's. 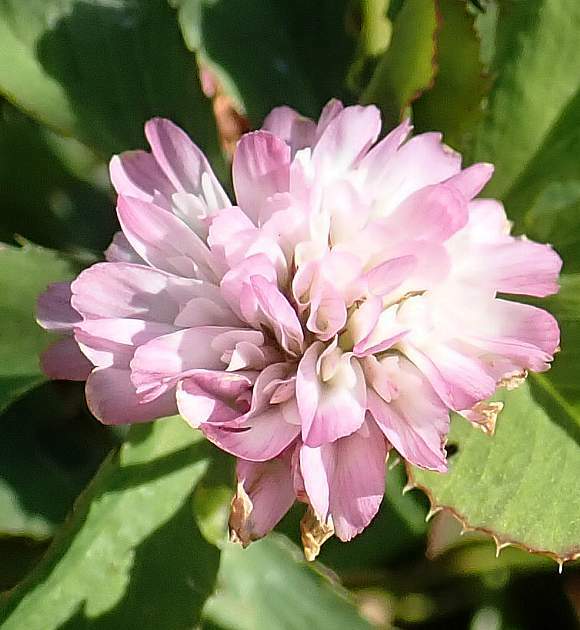 The flowerheads are flatter than the usually domed outline of other clovers. [the leaves here have been eaten by an insect]. The main stems are thick, very long and often ribbed. 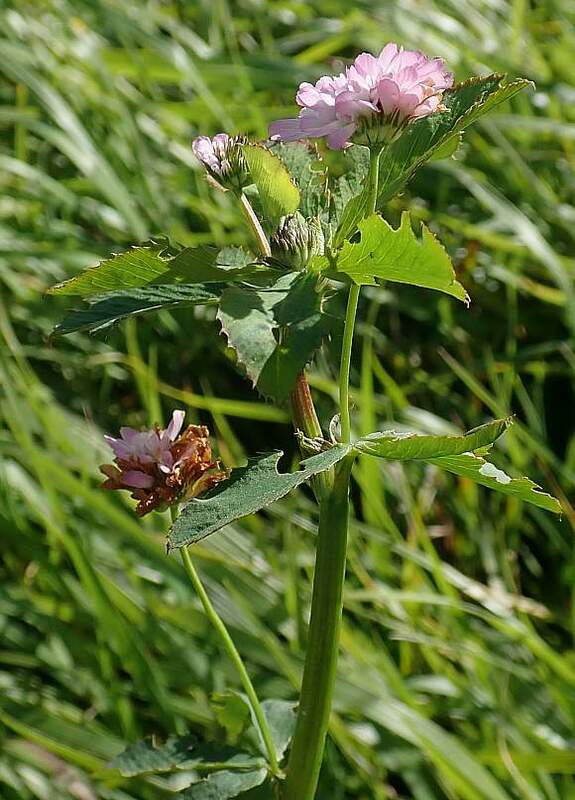 The flowerheads are on longish petioles (stalks) with only a few branching off near the end. These leaves have been nibbled less by insects. Leaf teeth longish, pointed, forwardly directed. Viewed by transmitted light the leaflet veins are paler and often end at a tooth. There are two sets of trefoil leaves in close proximity, giving the impression from above that there are 6 leaves around each. At each branch from the main stem are a broad pair of darkly-striped bracts (at least when viewed from below). 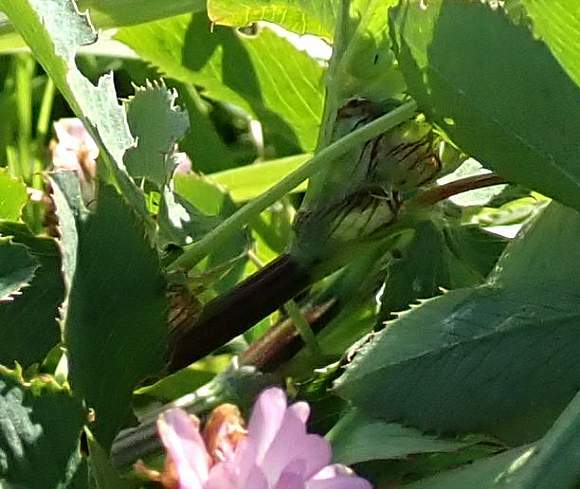 Viewed from below the flowerheads have a flattish conical base which has a pale central annulus and dark-green teeth. Only when the flowerhead is inspected close up from above do the above anomalous facts become clearer: each pea-type floret is upside down! 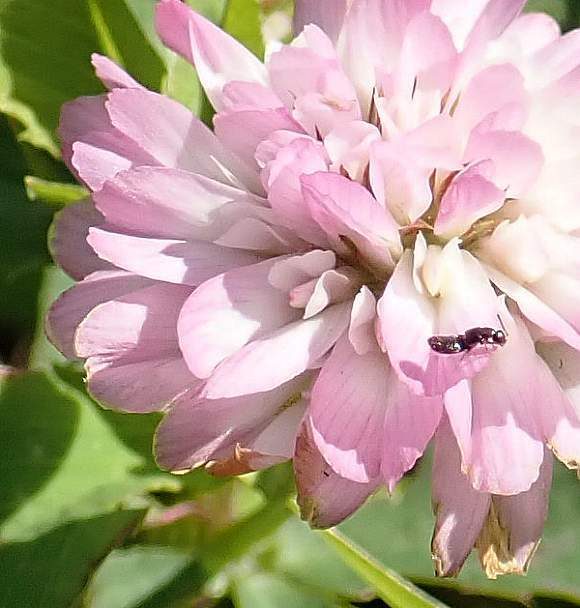 to what is normal in other clovers: The banners here are below the wings and the keel petals! [The flowerhead at top right is still unfurling]. It is the longer banners of the florets which are splayed out around the circumference which makes it appear flatter than other clovers. 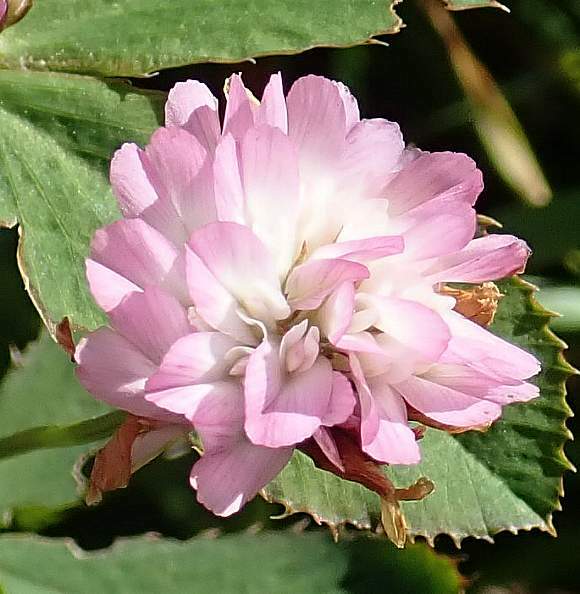 [The inner florets are still the wrong way around but more upright (banner towards the outside; wings and keel towards the centre of the flowerhead). 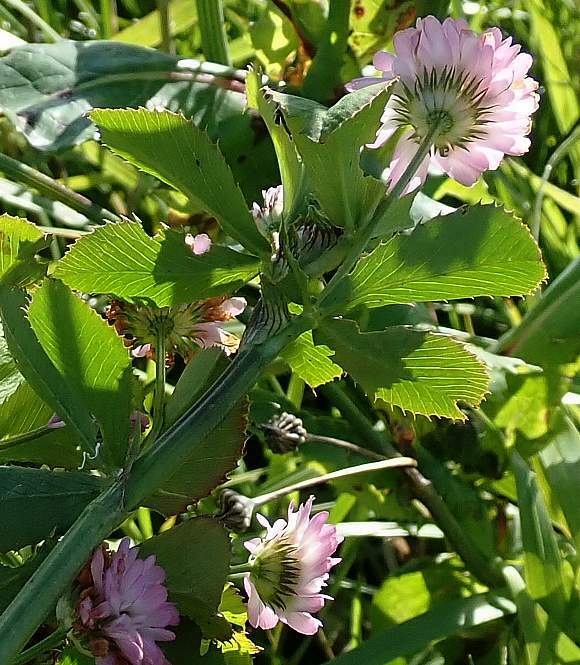 The large banner petals are facing the outside whilst the smaller wings and keel petals are facing towards the centre of the flowerhead. In the centre are the sepal teeth of the inner florets. The banners, wings and keel are plainly visible in the floret directed towards the bottom left corner. The banners of the inner florets are still wrapped up in rolled-newspaper fashion here, hiding the wings and keel. 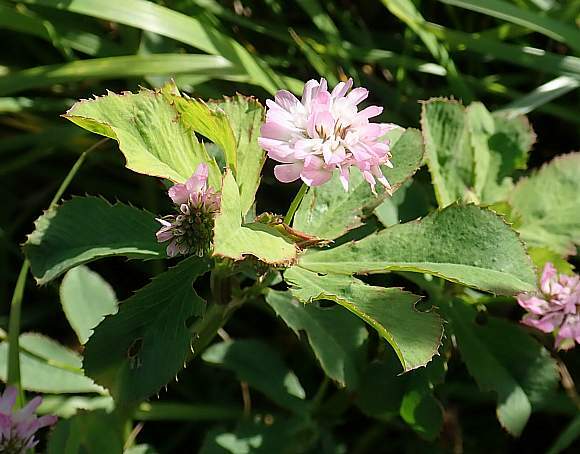 In a flattened conical shape below the flowerhead are the sepal cups with their teeth. 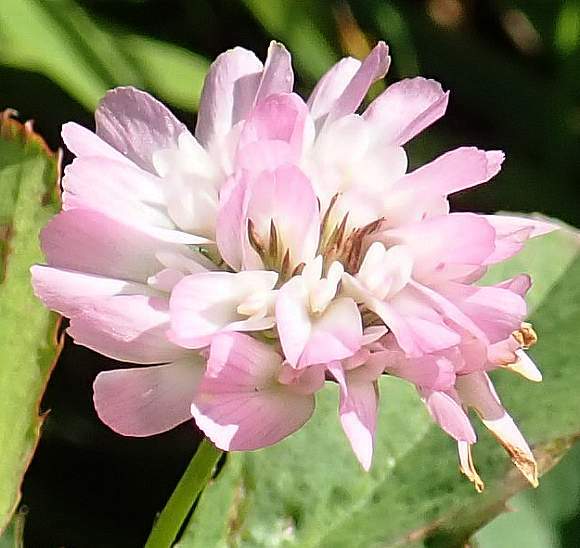 Because the flowers are upside-down in comparison to other clovers, so too are the sepal cups. 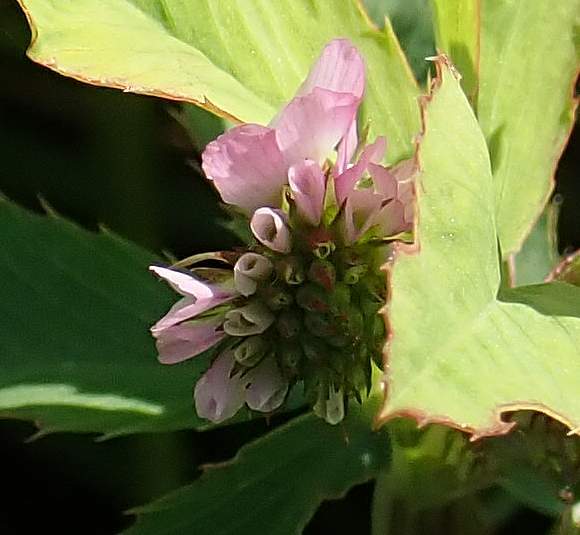 The cup parts of the sepals are nearly white whereas the sepal teeth are dark green. 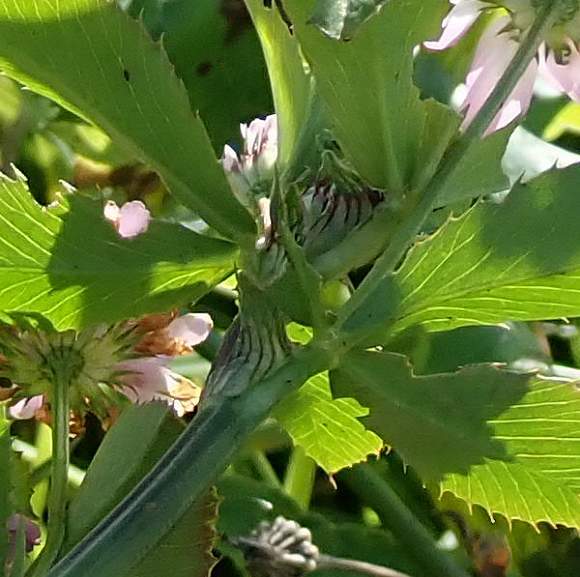 It is the 3 shortest teeth (dark green) which are showing on the underside of the flowerhead (whilst the 2 longer sepal teeth are on the other side of the florets helping to direct the banners of the outer florets outwards). 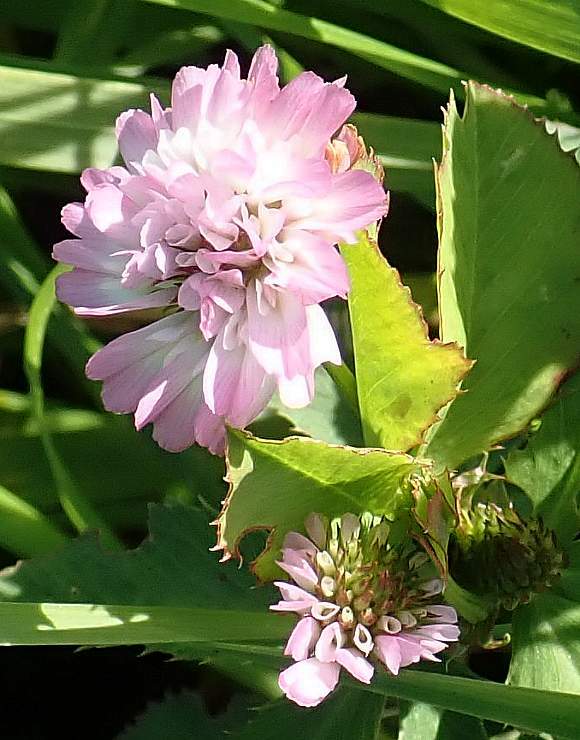 This is the 'florets upside down' meaning of Reversed Clover. 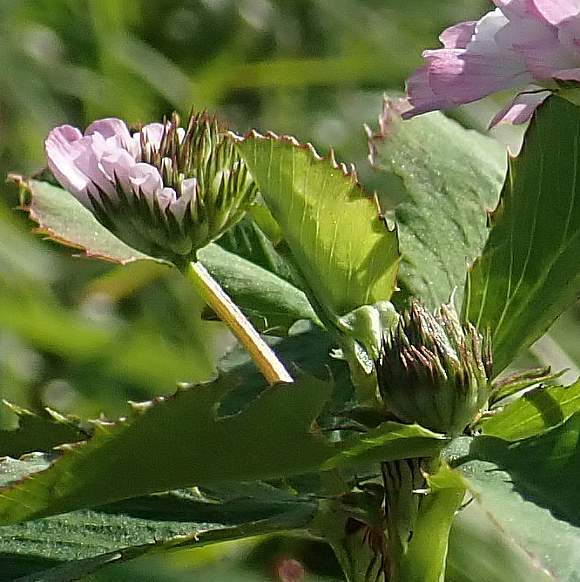 These two flowerheads have yet to fully open, the lower one being at a less advanced stage than the half-open upper flowerhead. Here the sepal teeth of each sepal cup can be seen simultaneously, unobscured by the still to emerge florets. Note the square petioles (flower stalks). 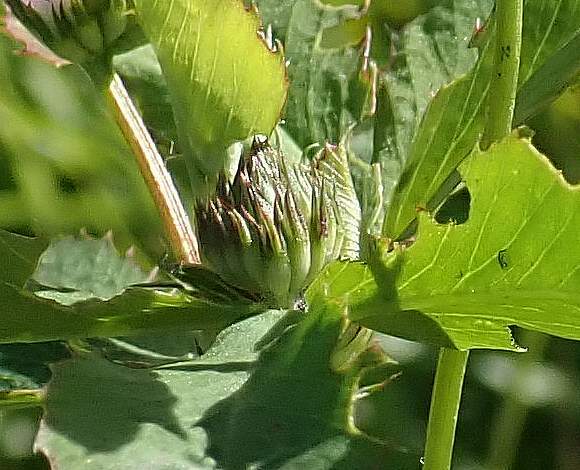 A closer view of a still developing flowerhead with the florets yet to emerge from their sepal cups. The outer 3 teeth are shorter than the inner two. 3 sets of trefoil leaves. The leaves have forwardly-directed sawtooth teeth, the points of which correspond to the edge termination of the leaf veins (which is why they are forwardly directed - because the veins are directed at c. 45° outwards from the main central vein which is where the leaf is folded). At each side of a branch from the main stem are a pair of broad darkly-striped bracts (at least when viewed from below). At each side of a branch from the main stem are a pair of broad darkly-striped bracts (at least when viewed from below). Leaf teeth at every vein termination. The main stems are either grooved or more usually ribbed (there are at least 4 main stems visible here). 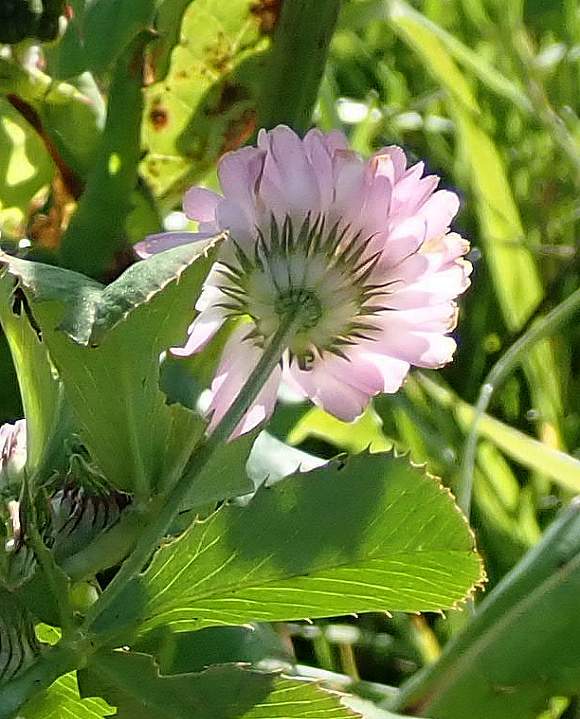 Reversed Clover is in the same sub-family of Trifolium as is Strawberry Clover (Trifolium fragiferum) - that of Vesicaria but the flowers of Reversed Clover are upside down unlike those of Strawberry Clover where they are the normal way around. 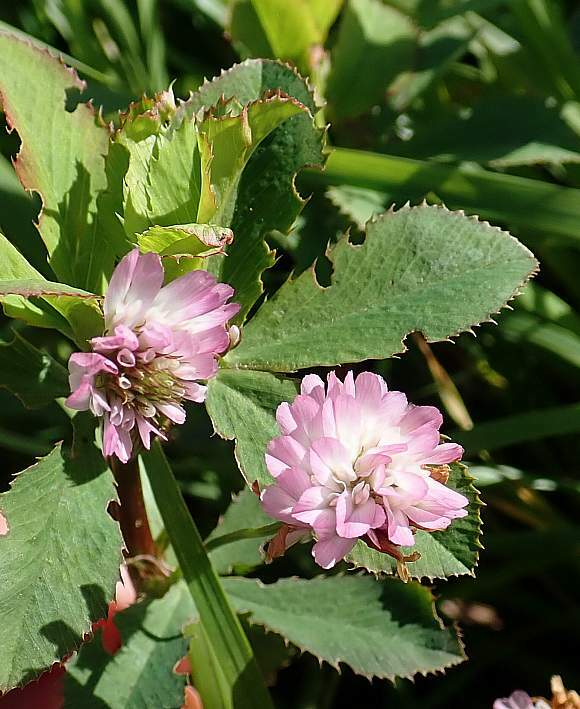 The two look totally different from each other except when both are in the fruiting stages where the fruits of both are bent over downwards, but those of Strawberry Clover are reddish brown whereas those of Reversed Clover a fawny brown. It is a casual neophyte growing randomly. It is also fairly widely planted as seeds in the margins of arable fields, which is the exact place your Author found it. 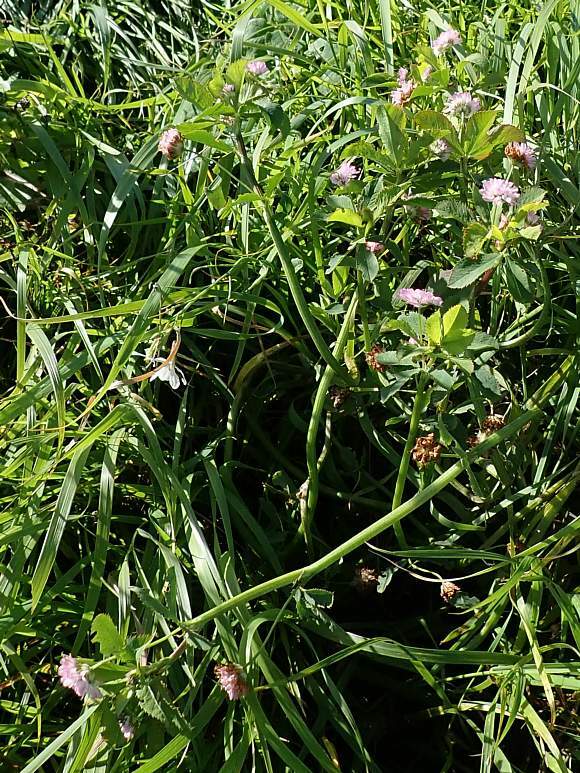 There it acts as a sown nectar mix and a green manure, supplying extra nitrogen to the soil which the plant has harvested by the aid of nitrogen fixing symbiotic organisms from the air. There is then no need to apply expensive nitrogen fertilisers. 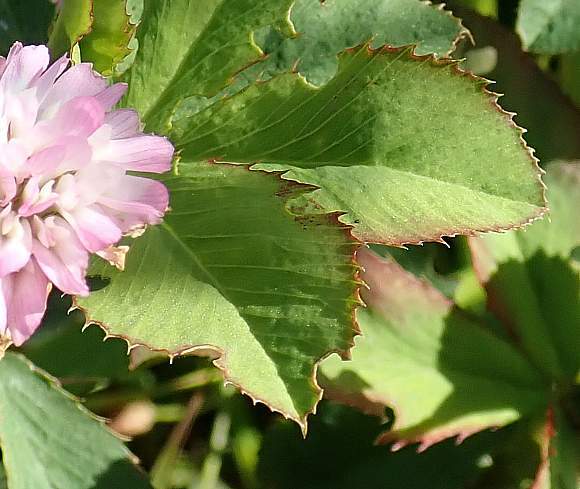 There is a similar, but smaller flowered Clover in the same Vesicaria section as both this and Strawberry Clover called Woolly Clover (Trifolium tomentosum) which is very hairy and with the calyx teeth being completely or almost completely obscured but the flowrs are smaller (3 to 6mm (as opposed to the 5 to 7mm of Reversed Clover) and which is much more procumbent than is Reversed Clover with stems half the length (at 15cm long) as that of Reversed Clover at 30cm.